It’s important to understand the difference between all the different oilfield trucks on the market. Oilfield trucks all have very different features that help them play crucial roles when extracting oil on a daily basis. While they all need to perform different functions, they must have some common characteristics. It is vital that all of the trucks working on the rig be tough, powerful, and most importantly RELIABLE. For this week’s blog we wanted to write about the different types of heavy oilfield trucks that we offer at Tiger General. As well, we wanted to provide some short descriptions about each type of truck to familiarize our readers with each one a little bit more. If you are in the market for an oilfield truck, you can see our full selection of new and used trucks on our website. The trucks that we will be talking about (and offer) are swab rigs, winch trucks, and vacuum trucks. Swab Rigs are primarily used to remove fluids from “production zones” of a well. The removal of these fluids allows for the extraction of the natural resource inside. The Swab Rig is normally backed up so it is as close to the well as it possibly can get. A cable is then lowered into the well via a winch. The Swab Rig then moves the cable up and down in the well. This creates bottom-hole pressure which allows the well to “Run”. This creates bottom-hole pressure that pushes the natural resources to the top of the well so they may be removed by oilfield workers. For information on how the swabbing process works, you can check out our previous blog post. According to Motorera.com, a winch truck is a truck where “a winch is a powered spool wound with cable. Winches are used to lift or to pull heavy objects. 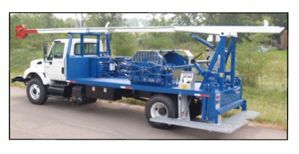 Winches vary in size from those on the front of small vehicles to heavy equipment which may weigh tons.” These trucks are primarily used for carrying heavier items such as oilfield equipment from location to location. If you’ve ever seen large semi trucks on the highway that are carrying tractors or smaller trucks, then you have seen a winch truck in action. 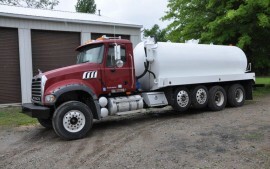 Vacuum trucks (or vac trucks) are trucks that are used to carry liquids, solids or sludge that are held in a large tank on the back of the truck. These trucks use a large heavy duty vacuum to remove any substance that is loose enough to be pumped. These trucks can be used to carry sewage from septic tanks, contaminated soil, and brine water from oil drilling sites. While vacuum trucks are commonly used in the petroleum industry to transport natural resources, they are also used in several different ways as well. They can also be used for street and sewer cleanups by town governments. As well, they are used to pump out grease interceptors that are used by various restaurants across the country. Vacuum trucks are a great way of transporting any odd or unsanitary elements that need to be removed from a particular area. While many of these trucks may not have the glamour of your shiny new Dodge, they are instrumental to getting things done in the oil rigs and other industries. They may not be the prettiest or the most popular, but they contribute to our society more than most people could even guess. Hopefully now you have a better understanding of the different types of heavy oilfield trucks we offer here at Tiger General. Now go forward and proper oilfield heroes!! 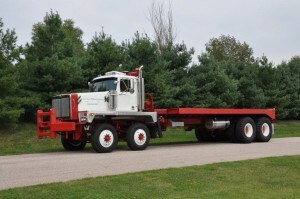 Mark, this had some great information on the different types of oilfield trucks. I think you’re right about the importance of understanding the difference of each. From my perspective, I imagine that it’s always going to be a benefit to understand the equipment you’re working with, especially when it concerns your safety.